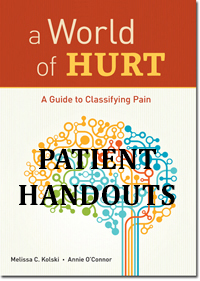 Here is an essential companion to A World of Hurt: A Guide to Classifying Pain. This product is a zip file containing PDFs of all eleven of the highly effective Patient Education Handouts from this book. Load the Patient Handouts to your institution's network and deliver patient handouts at the point of care. Improve results with musculoskeletal pain patients by supplying key information when and where it's needed most. There is no time or quantity limitation on the distribution of these charts to your institution's patients. Feel free to add your institution's logo to the upper right of the first page of each of the handouts. Melissa C. Kolski, PT, OCS, Dip MDT, is a senior education program manager and practicing clinician at Shirley Ryan AbilityLab (formerly known as the Rehabilitation Institute of Chicago), with a specialty interest in spine care and treatment of patients with musculoskeletal pain and dysfunction. Annie O’Connor, PT, OCS, Cert. MDT, is a clinical manager at Shirley Ryan AbilityLab with a specialty interest in musculoskeletal pain and dysfunction.